“We like to see the smiles on people’s faces after they’ve bought one of our birds and they come back for another one” said Mark Robbins of K and M Farms on MacLure Road in Abbotsford. Growing pasture-raised chickens and turkeys, Mark and his wife Kathy and their daughter, Jill, have just five acres of land for their farm. But it is quite amazing what you can do with five acres. “Small scale farming is a really good second income” said Mark. “It makes it possible to have a very pleasant lifestyle, you can grow a lot of your own food, and you get to live in the country – a great place to raise a family”. K and M farms raises about 2000 chickens and about 700 turkeys annually. Mark Robbins is also a Regional Agrologist with the BC Ministry of Agriculture and Lands in Abbotsford. It took he and Kathy quite a while to finally develop the kind of small farm operation that would suit their needs. 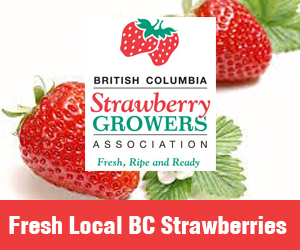 “We started with five acres in the Sumas Prairie growing vegetables” said Mark. “That didn’t really work for us so we then got involved with about 40 acres of raspberries and that didn’t work either” he said. Often people considering farming need to try some different options until they settle on the right one for them. “This takes time” said Mark. “It isn’t easy to get started but it has certainly been worth the effort for us”.